Neutral 100% PeptoPro® Casein Hydrolysate powder with amino acids, provides 12g of proteins per serving. In-house production! Last generation hydrolyzed whey protein isolate. Delicious flavor. Hydrolyzed whey protein. It provides 18g of protein per serving. Available in different flavors. Hydrolyzed whey protein. It provides 18g of protein per serving. Available in several flavors. 100% Peptopro® from Hydrolyzed Casein, for an optimal recovery and muscle growth. Blend of ISOLAC® (isolate) and OPTIPEP® (hydrolyzate). I bought the chocolate flavour. It is a bit too sweet but the flavour is great and it is lactose free which does not cause any digestive issues. I use it for my intra-workout along with cyclodextrins to enhance its absorption so that I can take advantage of its effects more efficiently. The format is a little bit messy since the bag does not close very well, but you can always use another recipient. Where can we buy Hydrolyzed Proteins? 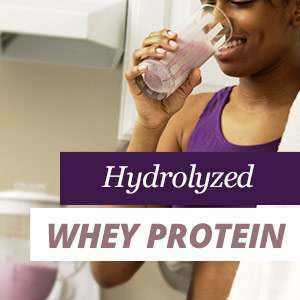 Hydrolyzed Whey Protein or Whey Protein Hydrolyzate (WPH) has a distinguishing feature, at a molecular level, when compared to the rest of the existing proteins: they are hydrolyzed, which means that they undergo a hydrolysis or molecular segmentation process, resulting in a pre-digested protein with a high peptide concentration.